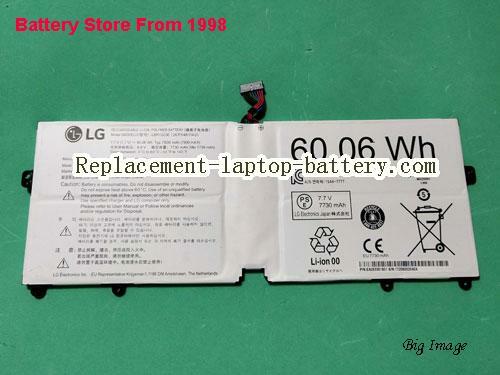 Original / Genuine LG LBR1223E Battery Li-Polymer 2ICP5/45/114-2 60wh(Li-Polymer 7.7V 7800mAh, 60.06Wh ). Fast Shipping in USA. This is a LG LBR1223E Battery Li-Polymer 2ICP5/45/114-2 60wh. 14Z970, 14Z970-A.AAS5U1, 15Z970-A.AAS7U1, 15Z970-GA50K, Gram 14Z970, Gram 14Z970-AAAS5U1, LG Gram 14Z970-AAAS7U1 Laptop Battery, LG Gram 14Z970-G Laptop Battery, GRAM 14Z970-G.AA5BB, Gram 14Z970-GAA52C, LG Gram 14Z970-GAA53C Laptop Battery, LG Gram 14Z970-GAA75C Laptop Battery, Gram 14Z970-GAA76C, Gram 14Z970-UAP71U1, Gram 14Z970AAAS5U1, Gram 14Z970AAAS7U1, Gram 14Z970G, Gram 14Z970GAA52C, Gram 14Z970GAA53C, Gram 14Z970GAA75C, Gram 14Z970GAA76C, Gram 14Z970UAP71U1, Gram 15Z970, Gram 15Z970-GAA52C, LG Gram 15Z970-GAA53C Laptop Battery, LG Gram 15Z970-GAA75C Laptop Battery, Gram 15Z970-GAA76C, Gram 15Z970GAA52C, Gram 15Z970GAA53C, Gram 15Z970GAA75C, Gram 15Z970GAA76C. Online shopping for high quality and cheap LG LBR1223E Battery Li-Polymer 2ICP5/45/114-2 60wh. All LG Laptop Computer Batteries and LG Replacement Laptop Batteries are 30 Days Money Back, 1 year warranty.